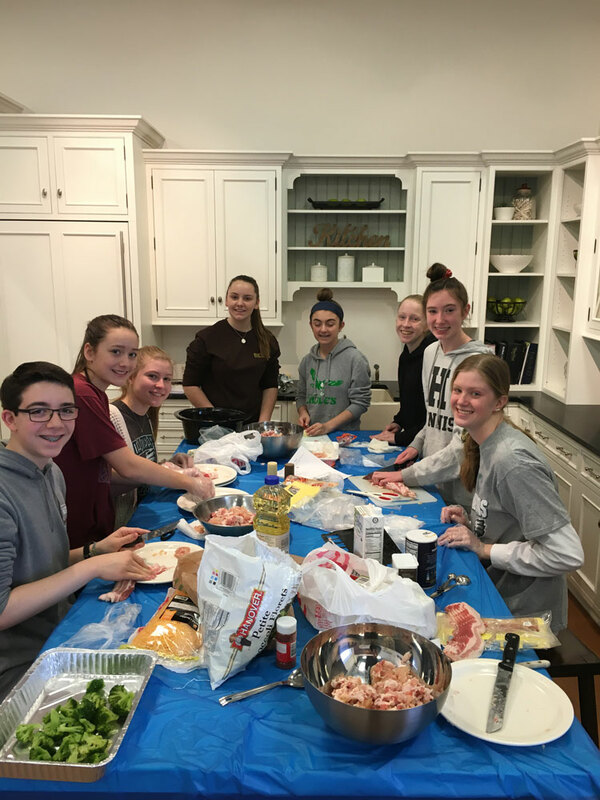 Students from Henderson High School’s Kids “4” Kids Club gathered at The Kitchen Studio at Pine Street on Sunday to prepare meals for Safe Harbor of Chester County. Students from the Kids “4” Kids club at Henderson High School turned into chefs and bakers on Sunday afternoon as they gathered at The Kitchen Studio at Pine Street in West Chester to prepare meals for Safe Harbor of Chester County. Located in West Goshen, The Kitchen Studio is the kitchen and bath showroom of Pine Street Carpenters. Students spread out throughout the showroom, utilizing a working kitchen at The Kitchen Studio as well as several of its other kitchen displays. There they cut, chopped, measured, mixed and baked, filling the showroom with the aroma of home cooking and the sounds of teenage camaraderie. By the end of the afternoon, the Kids “4” Kids club had prepared a dinner for 20 that included a chicken and potato casserole, green salad, fresh baked rolls and chocolate chip cookies. The students planned the meal and prepared everything themselves. Kids “4” Kids is a service club at Henderson High School that plans events throughout the year to help others, including raising money for non-profit organizations that help children. Visit www.kids-4-kids.org for more information about the group. The Kitchen Studio at Pine Street opens up it showroom to local organizations and businesses for fundraisers, networking events, kitchen demonstrations, wine tastings, book groups, Bunco nights, and more. To inquire about hosting an event at The Kitchen Studio, call 610.430.3333.